So far on our website Christa and I have been trying to incorporate photos and text on every page. I am also working on an ArcGIS map to embed into our website about the path of the people we have interviewed. In this map, I am also including important places from both their origin country and from Maine. We may also by using video as a way to share the audio of the interviews with the captioning. I, however, am still trying to think of a way to have some visuals throughout the interview audio for those who may benefit from that. To improve our website we will be adding more pages to make navigation easier and also add a sidebar to move around the website as well. One of our hopes with the website is that we will be able to present information in a variety of ways so that it is enticing to viewers. As of right now Christa and I have not conducted any interviews. However, we have taken steps to set up interviews though. One thing we have done for our project is attended an on camps panel about migration in our state. The people on this panel were actively working with migrant communities in Maine. We decided to reach out to Fatuma, the woman responsible for the Immigrant Resource Center of Maine. Christa was able to introduce herself to Fatuma and present our project to her, Fatuma seemed to be happy to help us find people to interview. We have sent an email to Fatuma with information about our project, and are waiting for a response from her. In order to stay productive, I have been using this time to work on our website. I have been working on setting up the pages and building the navigation structure of the site. Christa and I have also been working on our website texts in a google doc. We are doing this so that when we are content with the text it can be easily added to the website. When writing our mission statement Christa and I tried to give as much context to our project as possible, and convey the projects relevance and importance. We both gravitated towards making our project as educational and community orientated as possible. I believe that this is important because the area we live is not very diverse, so there may be many misconceptions around migration. While talking about digital tools Christa and I both wanted to make sure that there was a diverse range of ways to get information. However, we did not make any concrete decisions regarding what tools we will have featured in our website, which is something that we will be addressing before submitting our final contract. A few of the tools we will definitely be using are videos posted on YouTube, audio of the interviews, and an ArcGIS map. Overall, we hope to make our website intriguing, accessible and informative. Christa and I also decided that it would be beneficial for us to have a shared google calendar in order to keep track of shared deadlines, and mark progress so that we can be on the same page. We have set extra deadlines in addition to the ones given by our professors, we decided to do this to give ourselves more constant deadlines so that we will always be working toward completing our project. When talking about our responsibilities Christa and I both decided that we would be responsible for certain things dependent upon on our confidence and skills concerning certain tasks. For example, I will be responsible for making the first outline of our website, because I am comfortable building websites. One of our big shared responsibilities is to maintain proper use of citation in order to avoid copyright and fair use infringement. We also chose to add a for more information page, this is in part to help us in following copyright law but also to give viewers a way to learn more about migration. In order to help our project reach as many people as possible we will be promoting it in many ways. One will be distributing flyers with a QR code linked to our website. The other will be making contact with some of the organizations on campus that might find this information useful (ex. Diversity initiative, Aspiring educators, Alpha Lambda Delta, Multicultural Club). We will also be contacting all of the establishments that help us find interviewees to share the finished project with them. Lastly, I will be presenting our project at symposium, which is the day when undergraduate research done by students at our university present their projects and findings. Overall, I felt like this contract helped Christa and I work out some things we were unsure of. I also feel that after writing it I know the steps I should be taking in order to advance our project. Below is a brief outline of the steps we will be taking in the next months to complete our project, as well as some of the materials we will be using to do so. The University of Maine at Farmington special; archivist Laurie Macwhinie, met with us shortly after class on Thursday morning she led us into her office then shifted boxes full of files and piles of books to clear a spot for us. After describing our project Laurie had a great deal of information about how we could find groups of immigrants around our area that we could research and interview. A couple things that I found particularly helpful was to look at Maine memory network and the US census information. Through these two things, I got a general idea of some of the groups that are a part of our community in Maine. Through this research, I found out that the two largest groups of immigrants were from Somalia, Iraq, and China respectively. I was also really excited to find that our immigrant population, though still small, was much more diverse than I had originally assumed. I had learned that Maine has also since 2000 had a growing refugee population which includes many people from central and eastern Africa. You can see this on the map below, where I used a newspaper article to map the groups that are most frequently taking refuge in Maine. 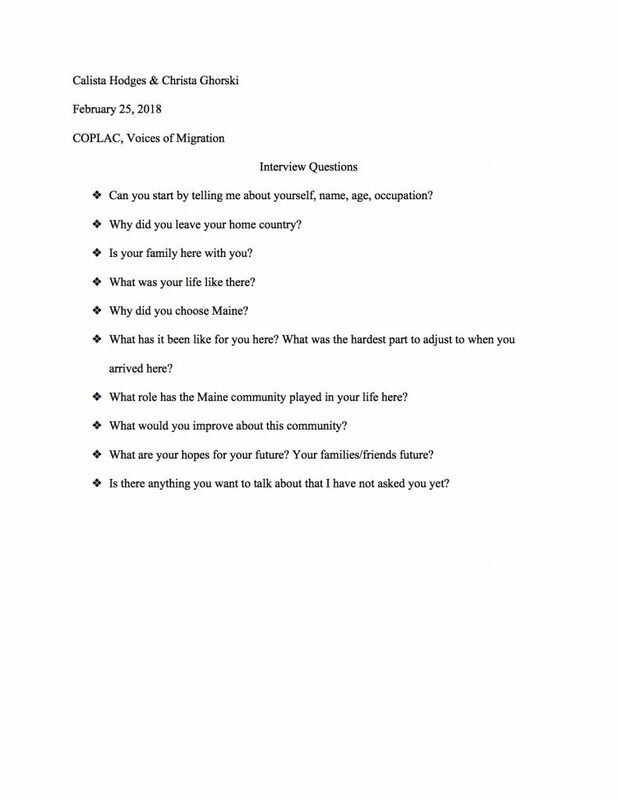 When learning about these groups I felt that the migrant groups that we could interview are Iraq, Somalian, Central-Eastern African, or Chinese. I feel like these are the biggest groups in Maine and the ones whom we would probably be able to reach out to the best. Below you will find some of the questions I have written. What was your life like there? Why did you choose Maine? What has it been like for you here? What role has the Maine community played in your life here? What do you wish would be different about the community here? What are your hopes for your future? Your families/friends future? In this task, we were to make a video about why migration matters and why it is important. The more I thought about this the more I felt it was important to get many opinions on it. I felt this way because migration should not just matter to those who migrate but to everyone. The process of making this video was a series of writing and images that were used almost like a technological flip book. Throughout the video I talk about why people migrate and why it’s important, then I share some of the thoughts of my peers on why they think migration is important.